Photo: Cooper's Hawk. Source: Wikipedia. I just witnessed a race to survive on campus – quite literally. And the winner managed, but ever so barely, to survive. That’s what I call reality – and it’s certainly not like the fake, highly contrived reality offered on television. It makes me wonder how much natural education students miss by spending their days walking to and from classes, taking lecture notes, burying their heads in textbooks, staring at computer screens, and twittering away their time in social networking. My afternoon work was interrupted for a short break to make a quick trip out to the WSU Arboretum & Wildlife Conservation Center to check on Fred/Fredricka, our young Columbia spotted frog, and also to look our other wildlife in the Endangered Species Lab. Plus, the trees in the arboretum nursery needed a drink of water – yet another good excuse to get out of the office for a few minutes. Of course, while I’m there anyway, who can resist taking a peak at our renovated pollinator gardens to see the thousands of bees in busy pollinating bliss while visiting our sunflowers, our beautiful blue borage (below), and other flowers in full fall bloom? Not me. I’m always curious to watch the frenetic activity for a few minutes, and to see which species of bees and butterflies might show up in the gardens. 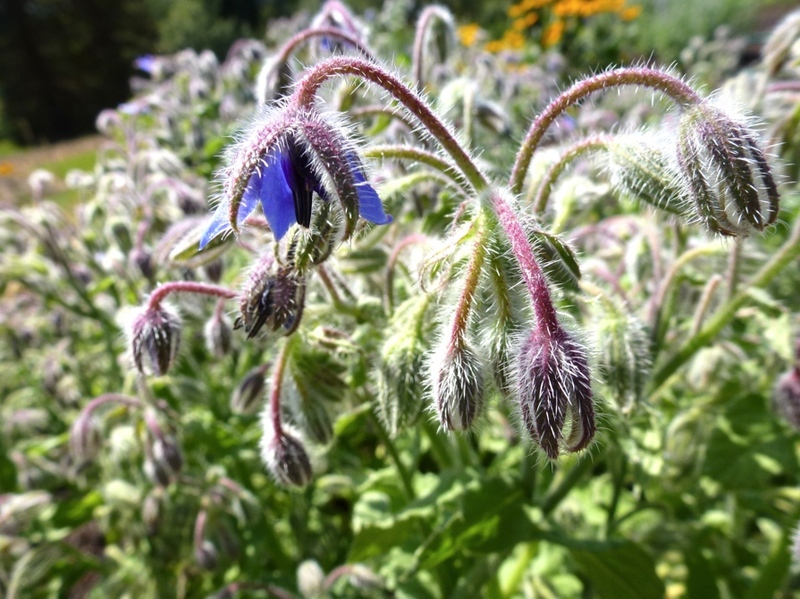 Blue borage flowers in the WSU Arboretum & Wildlife Conservation Center. 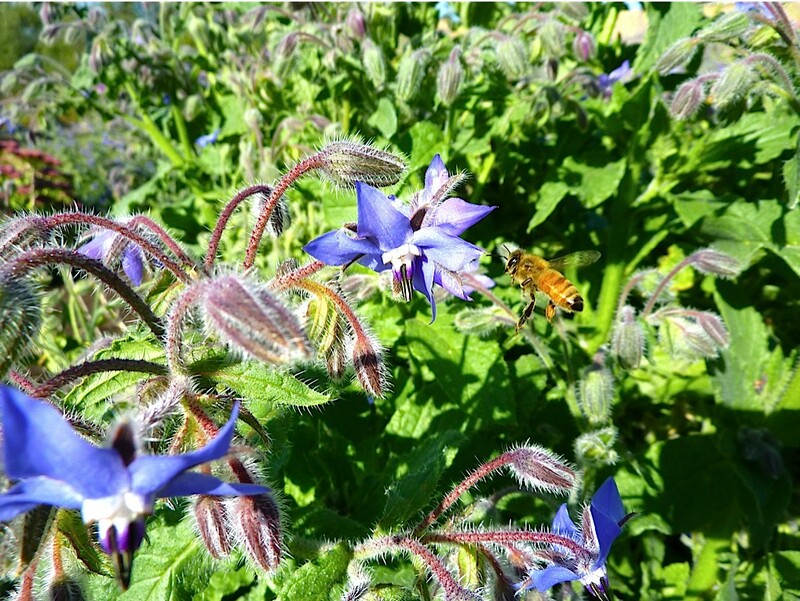 Honeybee visiting Starflower or Borage (Borago officinalis) in the Pollinator Gardens, WSU Arboretum & Wildlife Conservation Center. I’m willing to bet that our young arboretum is already the largest single gathering spot for bees on the campus of Washington State University. After all, we’ve got what it takes. Abundant nectar and pollen-producing flowers, and good clean water in several nearby small ponds. Honeybees, in particular, visit water sources frequently, using it to cool the bee hive through evaporation and also to dilute the honey fed to their larvae. We see as many honeybees visiting our small ponds to drink as we do visiting our flowers for nectar. A bee hive might send out hundreds of workers, making dozens of daily trips each, just to collect enough water to cool and support a bee colony. However, no sooner is the water started for our young quaking aspen trees in the arboretum nursery, when a tortoiseshell butterfly lands on an aspen leaf, only arm’s length in front of me. But, of course, my camera is left behind. When will I learn…? Lacking a camera, I quickly try to memorize the wing pattern on what I know is called a Comma or Anglewing butterfly. Which of several potential species it might be though, I don’t know. It could be another Satyr Anglewing like the one I saw in the small arboretum woodland this summer. But this individual is noticeably smaller and I wonder if that might be the case for those butterflies that emerge and fly during early fall just before the first major frosts arrive. Or perhaps its a different species entirely. A butterfly expert might know. Ironically, just such a butterfly expert is sitting in a graduate student office just a few doors down from my campus office. Tyler Hicks is a doctoral student from WSU Vancouver taking classes at WSU Pullman this fall. His wife, a wildlife biologist, happens to be my graduate student and she is studying long-billed curlews – but that’s another story. Back to butterflies. Fender's blue butterfly. Source: Wikipedia. Tyler is working with Dr. Cheryl Schultz, WSU Vancouver, on an endangered subspecies of butterfly, the Fender’s blue butterfly, which is found only in the Williamette Valley of Oregon. Despite my being trained as an avian ecologist, and now working on threatened and endangered mammals, and even amphibians as well, I also love to watch butterflies and am intrigued by the ecology of insects and other invertebrates – all of the small things that actually run the world behind the scenes and help make it so beautiful. Tyler and I have had some great conversations about ecology and nature, but unfortunately, right now he doesn’t do me any good sitting back up on campus in front of his computer, working away diligently on his dissertation research, but in complete oblivion to my taxonomic confusion. Just as I step forward to get a better look at this butterfly, it takes off. I laugh at my continuing folly as an amateur butterfly biologist (and someone forgetful of bringing their camera to the WSU Arboretum & Wildlife Conservation Center), but console myself by walking over to take a look at the pollinator gardens. Photo. 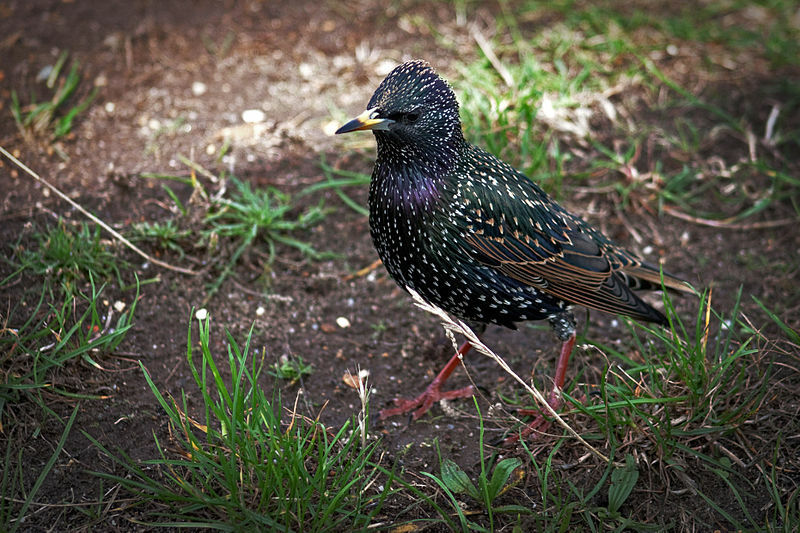 Common starling (Sturnus Vulgaris). Source: Wikipedia. Only moments later, I hear a bird scream in distress and look up. On a steep hillside overlooking the pollinator gardens, a small hawk pursues an even smaller bird downslope. The small bird is a starling, desperately flying as fast as it can, trying to escape the hawk giving chase. As both birds dive downwards from the hilltop toward the riparian area by the gardens, I’m instantly caught up in the chase and wonder if the starling will make a break for the cover of nearby conifers or willow trees in an attempt to evade the hawk. But it doesn’t. The starling again almost squeals, I suppose in fright or distress at the hawk trailing only about 10 feet behind. Much to my surprise, the starling continues to fly in a straight getaway pattern, making no dodging or darting maneuvers to escape the hawk right behind it. I stand there, fully expecting to witness the hawk grab the starling right in front of my eyes, but instead, after pursuing the starling for about 75 yards downslope, the hawk brakes off the pursuit and simply lets the starling fly away. Cooper's hawk (left) and Sharp-shinned hawk (right). Source: Wikipedia. Wait a minute! What did I just see? One second it’s an unknown butterfly, and the very next, it’s an unknown hawk. But at least as an avian ecologist, maybe I’ve got a shot at identifying the birds. Well, the hawk was small, but I know it wasn’t a tiny kestrel, North America’s smallest falcon and a predator so small it often eats insects like grasshoppers. So that probably means one of two things. It’s either a Cooper’s hawk, or a Sharp-shinned hawk. Already I’ve got it down to one of two species, but that’s as far as I can go. Cooper’s hawks and Sharp-shinned hawks are somewhat difficult to tell apart at a quick glance for the average ornithologist and average bird watcher. And when they’re flying by rapidly, chasing a bird, it certainly doesn’t make identification any easier! To make matters worse, these hawks also overlap in size, and so I’ll just send you to our good friends and colleagues at the Cornell Lab of Ornithology, and hope that you can figure it out from the identification guides there if you happen to see a small hawk chasing birds at your bird feeder. Yes, the term “bird feeder” certainly takes on quite a different kind of meaning when you have these hawks in your backyard. I sometimes feel sorry for the mourning doves that seem especially susceptible to these fast predatory hawks that specialize on small birds. As always, even the good intentions of humans to put up a bird feeder has consequences in the natural world. Chokecherry shrubs bearing fruit in the WSU Arboretum & Wildlife Conservation Center. As soon as the chase scene is over, I realize exactly how it came about. The last several weeks, students in my restoration ecology class and I have been walking around the arboretum landscape, talking about ecological design and restoration planning issues. One day, as I took the class on a hike on the nature trail running through the arboretum woodland, I noticed a small pile of feathers on the path, which told me that a red-shafted flicker had been taken, probably by a small hawk, rather than an owl, because flickers are active during the day. The feathers lay in graceful, silent testimony to the tooth and claw of survival in the wild. 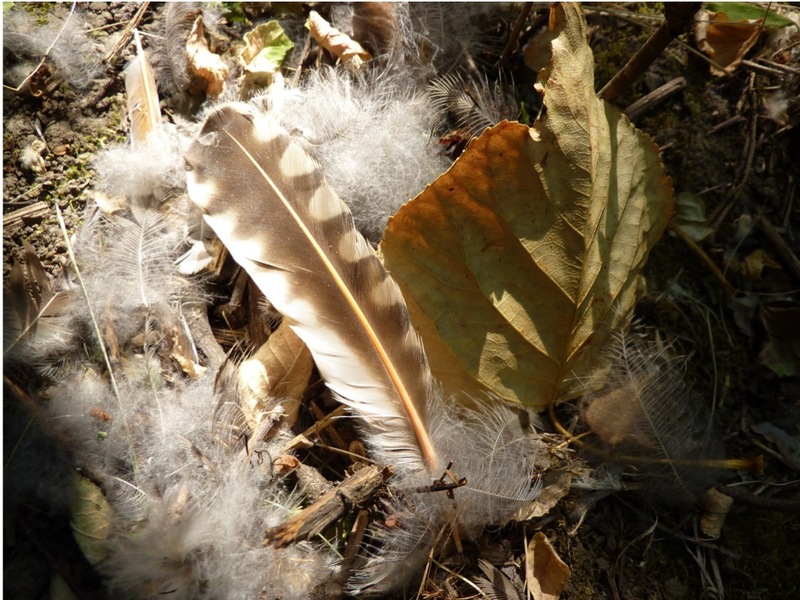 Feathers of red-shafted flicker (Colaptes aeratus), a member of the woodpecker family, probably taken by a small hawk in the woodland of the WSU Arboretum & Wildlife Conservation Center. Flickers are unusual woodpeckers in that they often feed on the ground. I wonder if this particular bird might have been surprised by a hawk while searching through the leaves and duff on the forest floor for insects. Fortunately, flickers are one of the many species of birds which will benefit from our plan to increase the size of the arboretum woodland and plant surrounding ponderosa pine savannas of mixed trees, grasses, and native shrubs. Photo: Northern Flicker. Source: Wikipedia. The large hilltop overlooking the arboretum nursery and pollinator gardens contains a historical planting of varieties of chokecherry (Prunus virginiana) and other shrubs, that are now essentially as tall as small trees. On one of our hikes through the arboretum, we noticed an exceptionally heavy fruit set on the shrubs this fall and I was foolish enough to remind myself why the berries are called chokecherries, especially when their astringent, bitter taste hasn’t been mellowed by enough ripening. In central and northern parts of North America, chokecherries once were the most important fruit in diets of Native Americans, and were used extensively in a variety of foods and medicinal treatments. 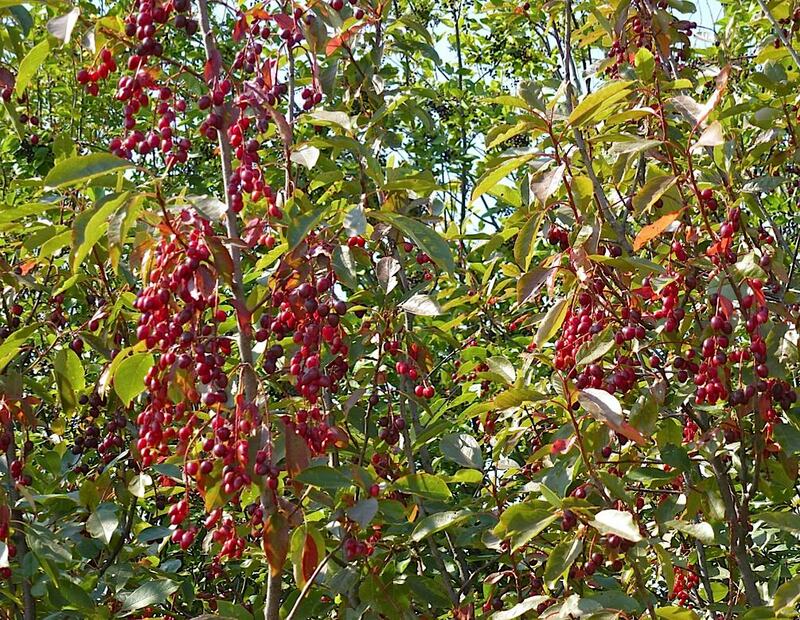 Today, most of us probably think of the tasty, but tart, chokecherry jams and jellies that can be made from ripe fruit. 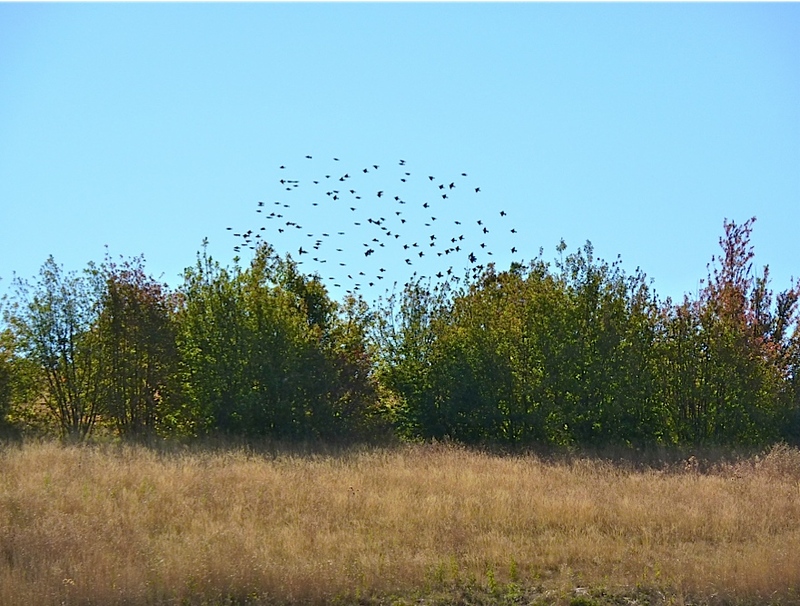 Distant, telephoto view of flocks of starlings visiting chokecherries and other fruiting shrubs on a hilltop in the WSU Arboretum & Wildlife Conservation Center. For the last few weeks, I’ve noticed large flocks of starlings, spiraling out of the sky and dropping down into the chokecherries in the arboretum. At the time I just paused to watch for a minute, not at all surprised by these birds going after ripening fruit. But it appears that I wasn’t the only one watching. Given that our chokecherry and serviceberry shrubs are on the open summit of a large hilltop, there is no nearby cover for small birds when a hawk attacks. Moreover, Cooper’s and Sharp-shinned hawks are experts at maneuvering through trees in pursuit of small birds. Starlings are not as well adapted for rapid flight through trees and branches, and so now I wonder if the scene I witnessed wasn’t the best chance for the starling to escape. Having been singled out of the flock by the pursuing hawk, the starling’s odds of survival must have dropped dramatically and perhaps the best or only option left was to fly downhill as fast as possible until the hawk hopefully decided the long distance chase wasn’t worth the effort. While these small hawks are well known to eat starlings, this is the first such chase I’ve witnessed, but now I’m curious to see if hawks continue to hunt the birds feeding in the arboretum chokecherries. Part of the defensive strategy of starlings is safety in numbers. The starlings obviously fly to and from the chokecherry shrubs generally in large flocks, which makes it more difficult for a given individual to be singled out as prey. And many eyes makes spotting predators easier. For both the hawks and the starlings, the chase is a game of probability, chance, and individual decisions, but a game with real life or death consequences for each. That’s Nature’s reality. Photo. Sir Winston Churchill. Source: Wikipedia. All of this action happened so fast, that I marvel at what I witnessed in the arboretum in less than five minutes. We all live in our personal cocoons and distractions of offices, cars, homes, shopping malls, computers, emails, texts, television, music, and smart phones. But life, real life, goes on around us all day outdoors. Right here on the beautiful campus of Washington State University. Most of us are simply too busy to notice very much. And yet, our life, all of our collective lives, completely, 100%, without doubt, depend entirely on the continued functioning of the natural biological world. We might think we’re above nature, and that clever technology will solve every problem we create, but the reality is that we deceive ourselves. The whole global economy ultimately is based on the natural world. Our lives depend on the continued productivity and ecological functioning of the real world. Our gadgets, gimmicks, and tricks may buy us a little time, but in the end, they will not “save the world” for a great many species and the whole world will be diminished for everyone. End of lecture. End of story. Period. If you don’t understand, no matter what your academic major, please come see me after class and I’ll give you some interesting reading which you will enjoy and which will add measurably to the depth of your university degree. In many respects, the human world increasingly seems to be turning inwards, all the while that the real outer world that supports us, is in decline. We see productive soils washing into the oceans, deserts increasing in size, contaminated and declining groundwater and freshwater, food systems stretched to the limit by human population growth, tropical forests evaporating into stacks of cut trees and hamburgers, and on top of it all, global climate is changing so rapidly that many people will live to see the Arctic ice packs disappear in summer. Photo. Earth as viewed from space. Source: Wikipedia. We have now entered what scientists call the Sixth Great Extinction of life in the 4+ billion year history of Earth – only in this global extinction event, it’s humans, rather than natural forces, that are directly threatening at least 30% or far more of many species with extinction. How does Washington State University address these issues? WSU has long recognized that our efforts in biology, earth science, ecology, environmental science, natural resources, wildlife, and sustainability are a necessary pillar of our success if we are to be a major land grant university with a vision for the future. We are currently forming the new WSU School of the Environment to bring more focus and integration to our academic efforts in these areas. And we are taking the first major steps to grow and develop the new 170 acre WSU Arboretum & Wildlife Conservation Center on campus as an outdoor ecology classroom that’s open for everyone. I don’t know exactly what Nature will teach you if you visit our arboretum and wildlife center, or just any place outdoors near where you live, but I can guarantee one thing. The instruction is both fast and furious, and yet, it also is slow and patient and lasts a life time. When you want true reality, and to put life in perspective, look to Nature as your teacher, even if it’s just for five minutes. Greetings to Dr. Robbins. I worked with him as a student many many years ago feeding fawns, while he did research on elk and aspen leaves. We trapped Big Horn sheep and it was an amazing experienced. He was the essence of a brilliant kind researcher that was patience with everyone.